I have been using Lanocote on threaded metal fasteners. It is basically a waxy material made from lanolin and seems to work like a charm preventing galvanic corrosion. You can buy it from boatyards for marine hardware and Backscatter stocks it. I used Seavison in San Diego. They did a great job; distance correction upper, plain glass lower. Find a mask with tall lenses (e.g. Scubapro Spectra) to give more real estate. I also had them bevel the lower edge of the upper corrective part, so looking downwards I am looking along the bevel, rather than across a flat, distorted transition. It gives the impression of no correction and makes more of the surface useful for vision. #398778 Strobe Positioning - Free 20 Minute Video Tutorial! Thanks for this! Comprehensive and excellent review tutorial for those of us who are not in the sea every day. Great refresher before the next trip. Nicely done. Very nice images, indeed! Any massive UW difference over D800 or D810 in your opinion? I emailed Oskar last Sunday, he answered within 10 minutes. Strobes are a beautiful pieces of elegant design. They look very robust. Tested out S-TTL protocol with UW Technics board (Thank you Pavel!) for Seacam. Testing done in air. Strobes respond MOST like Z240 YS-D1 setting (position 0) on UWTechnics board. YS-D2 position (position 2) on board overexposes in the middle apertures. Position 1 and 3 grossly over exposes. Can't say enough about Oskar and his company!!! Watch out for a listing on Craigslist Newcastle UK for a Nikonos RS kit including 13mm fisheye. He claims his name is Alexander Weiss. He did send additional requested pictures, so probably actually has the gear. I foolishly sent a bank draft for $2200 Cdn and received nothing for my troubles. That was 8 months ago. I see the listing is up again. The listing moves around Britain. It was in Glasgow when I first found it. I started a police investigation through the RCMP and Greenock police, but nothing has come up. Congratulations to Alex on his work with this emerging (re-emerging?) technology. Also a very well written lay-man's review of the optics and physics related to dome ports and wide angle underwater photography. I agree with Alex. I don't think megapixels are the issue. It's all about the water-glass-air interface. I would like to start this thread as a place to discuss the concept, so...fire away! #386799 Do 15mm's need servicing? #379262 Do 15mm's need servicing? I bought a beater 15mm Nikonos UW to see how it ticks. It is elegant in its simplicity compared to modern lenses. To work on it you need a small philips, small flat blade screwdriver, and an adjustable lens spanner with points. This is a specialty item, and available on Amazon. Don't try and remove the front glass without the proper tool... you will fail. Really only the control shaft "o" rings need to be replaced. These can be sourced on the internet from a fellow in France for a few dollars. The three big "o"rings behind the front glass and the acrylic window are not really "o" rings but compression gaskets. 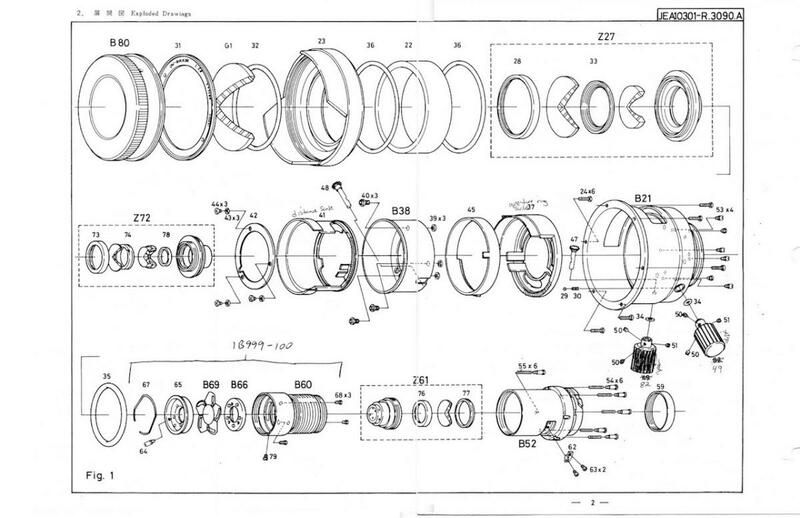 In order to replace the shaft "o"rings you need to strip the lens down to its underwear. That is, completely disassemble the lens mechanically. This is not hard, but take photos and make notes as you go. Be carefull not to damage the large gasket "o"rings, you will have to reuse them. THEY ARE NOT AVAILABLE ANYWHERE. Some penetrating oil on the retaining ring (with the engraved writing) for the front glass is wise, but not much. Same for the tiny screws holding the shaft knobs on. These can be a deal breaker if corroded on. You may be able to sacrifice a 28mm lens for its knobs and screws. Also be really careful removing the six spring loaded screws at the back. If you strip these you wreck the aluminum body of the lens. Same goes for the six philips screws that hold the front lens element /sunshade to the body. Corrosion can be a problem with these screws. Remove the 2 control knobs with six TINY set screws. These may have a coat of laquer over the heads. They are super delicate. Remove the front glass retainer first. Don't ding the glass.. you can't replace this. Remove the front half (Sunshade) with the six philips screws. These are 2mm x 4mm. I replace these with SS socket head cap screws which are available at a bolt supply house, likely special order. Remove the six rear spring loaded screws with a small flat screwdriver. These are delicate. Remove the front lens element inside the dome with a lens spanner. That will allow the main optical body to slide out the back. I believe the knobs must be set at f/2.8 and infinity for the control tabs to line up and fall out. I recommend vinyl gloves when handling the optics to keep grease off them. Dismantle the inner mechanics completely down to the back wall of the housing. Work slowly and photograph or make notes of this. When you get to the back wall look out for a tiny spring and ball that sits in a recess and provides the click for the aperture scale. Push the control shafts back into the housing and remove the 'O'rings from the outer seat. Note which shaft goes where, as they are different lengths. Clean everything of old grease. I used alcohol wipes to do this but DON'T LET ALCOHOL TOUCH THE ACRYLIC WINDOW. It will wreck it. Reassemble: Use Nikonos grease on the new shaft "o"rings. The shaft is passed through the housing and "o" ring and the knob replaced pushing the gear from the inside. This is why you cant just replace the "o"ring from the outside. I use a tiny coating of white lithium bicycle grease ( I like Campagnolo) to lubricate the mechanicals, but only a trace. Reassembly is the reverse of disassembly. Take your time and it is actually fun. Use a thin layer of Nikonos grease on the "o" ring gaskets, just until they are shiny. Any locktite inside can be replaced with a dab of nail polish or touch up lacquer. Make sure you get the right knob on the right shaft, or you'll be tearing it apart again (I did). Use a small drop of laquer on the screw heads of the shaft lockscrews and note the orientation of the screws relative to the flats on the shaft. The screw positioning is assymetrical. When you replace the six screws that hold the front element/sun shade, watch the orientation of the shade. It goes with the sun shade projections at the 12 and 6 oclock position. Place the lens face down and preload the body with a bit of downward pressure as you tighten the six philips screws or the SS socket head capscrew replacements. This takes a bit of the load off the threads as this is a delicate area, and may have some corrosion already. Also I use a tiny bit of Lanocoat on all external threaded fasteners, as well as the six spring loaded screws in the back.. Anyway. That's my experience. No guarantees, but a fun way to spend a winter afternoon thinking about your next trip.